DH and I just finished a month long, work intense project that I’ll be writing about in a few blogs down the road. In the meantime, now that every spare second isn’t taken up, back to our regularly scheduled blog! 1) I have a rule in my family that everyone has to pound water the day before the long flights. So far no one has died from hyponatremia, and we all use the bathroom less while traveling. 3) We let the kids roam freer than they do back home. Yes, that means I had them memorize how to ask in Spanish for the ice cream they wanted and sent them with the money to the beach stand where I could sort of sometimes see them from the water. I figured since I wasn’t getting Amber alerts on my phone (seems these are regular occurrences when you live in Florida? )—and I’d seen a 4-year-old sent alone with her 2 -year-old brother to the ice cream stand—that’d it’d all be fine. And it was. Plus the boys were so proud of themselves after navigating the language barrier when the stand was out of their favorite ice cream one time! 4) I brought my RooSport purse. This is the best $20 I spent on a purse, ever. It has just enough space for money, credit cards, keys, and a phone. The super strong magnets secure it to your waist so no worries about someone stealing it. Be warned though: if your fingers get between the magnets when they’re closing, you’ll end up bleeding (!) and trying not to curse because you’re in so.much.pain (ask me how I know). 5) Eventually, we wised up: DH and I spelled each other from hanging with the kids for a few hours each day. We’re both introverts and need time alone daily to recharge. Since we didn’t do our usual exercise routine (DH biking and me running) we weren’t getting recharged. Unfortunately, we didn’t start doing this until the last week there. Wish we had done this sooner! 6) We did what I call “Relationship Travel.” My sister and her fiancé flew in from the UK to spend the weekend with us. It was especially nice as her fiancé is like the British version of my husband: they’re both tall and insanely kind men, so a good time was had by all. 7) We went to Africa for lunch. Guys! You read that right: we popped over to Tangier in Morocco for a few hours after we caught a ferry from Southern Spain. The food was incredible (again: Tagines. Go eat. Like now.). I’d highly recommend making a day trip and hire a local tour guide when you get off the boat. 8) We also went to Gibraltar. Gibraltar is amazing, and I’d do a home exchange for a week there in a hot second (any takers out there?). The food there was incredible too (can you tell a lot of our travel budget goes towards eating out?). 10) We intentionally pivoted and decided to do less. 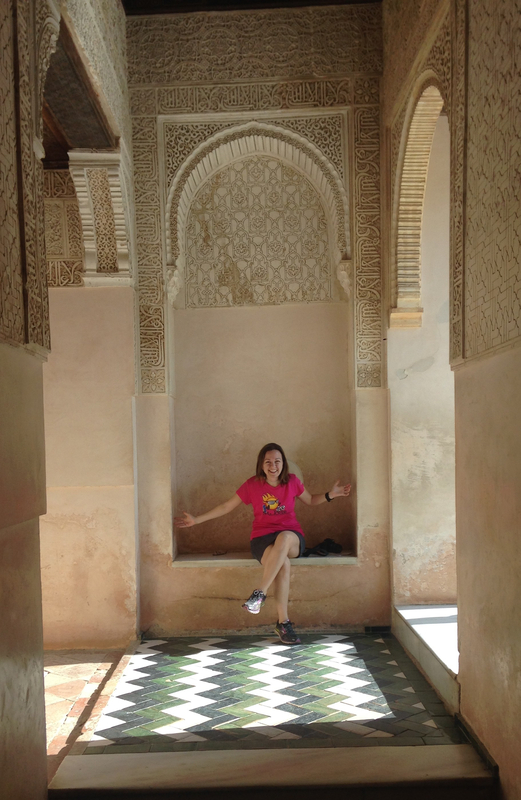 We could have gone to Marrakech or Córdoba, but it was just too much. Doing less is alright. Have faith there will be time for another trip in the future. (If you don’t believe that, then read this book. It’s beautifully written and everything a busy mom needs to hear at this stage in life). 11) We marveled at the beauty of the landscape. One of the nice things about living in flat Florida is you’re always amazed when you visit anyplace else because invariably they have hills. And sometimes mountains! Which brings me to: One unexpected side effect of the trip was that I came back even more fed up with American consumerism. It felt like my brain had “clicked into place”—a hard feeling to describe. When I was talking to my sister about it, she said when she lived in the States, she always felt like she had to get forty things done every day. But somehow, living overseas, she realized all those “things” can wait until the next week—or even the next month. That it’s more important to focus on getting enough sleep and making sure she has healthy food to eat the next day at work. In other words: it’s easier to focus on self-care when the frantic pace of high consumer, American life isn’t drowning out your attention. I talk about that aspect of European living in this interview. We’d love to return to Spain. Maybe in 2026 when the next eclipse hits there. For those who’ve traveled overseas with young kids, what are some things you did right? I hope to hear your advice in the comments. In the meantime, see you next time when I give tips on how to buy a vehicle alone. As in, no male relative accompanying you (I caused a bit of a stir on social media when I posted about buying a truck for our family by myself recently). Between fellowship and first real job we took three children — ages 6, 1.5 and 0.5 — to Spain for six weeks. Remember the great times, not the stress. Navigating with two children under 2 had its challenges, but until I retired I never had this much time off. Returned to US with about $100 in bank. Hung on until first real pay check. Wow! I never knew this about you. That’s amazing. I will have to pop over to your side of the state one of these days just to have coffee with you. I always love talking to you. Thanks for commenting. Love this post! So much I continue to learn from you, my friend. 1) Still working on getting the wife on board with home exchange…not in the cards yet. 2) May gift her a roosport since otherwise I inevitably carry her stuff. Brilliant gift idea, thank you! 3) We, too, are the bucket hat brigade! I come from flammable people, so we take sun protection seriously. 4) Letting the kids sprout their wings sounds wonderful. We try to let them free-range at parks with other kids, which inevitably leads to new friendships and greater confidence. 5) We have a one-thing-a-day rule with travel with kids, and it has served us well. Secret to happiness remains low expectations. 6) I get an espresso and reading hour. My wife gets time on the laptop. We both return saner and happier. Hey CD! I am SO EXCITED that you all are going to Spain also. I really hope you write a post about it afterwards as I love reading about your travels. The Roo sport is awesome. I used it for running at first but often end up using it daily (like now at Starbucks). Thanks for the comments-great ideas!. I think my biggest tips for travelling with a small child are to pack light, allow extra time for everything, and try not do too much in a day. Trying to fit too much in just results in tired, cranky kids (and grown ups) and the holiday becomes less enjoyable. Also, tagines are awesome! We spent some time in Morocco years ago and loved them. When we returned home, we wanted to buy a tagine but the ones in the homeware stores weren’t made the same and were crazy expensive. Then we found a Moroccan shop that was closing down to become an online business only and were able to get one for a bargain. We have used it quite a bit over the years and in fact, I’m making one for dinner tonight! Packing light seems to be my hardest thing these days (I say as I’m about to haul two suitcases and two carry on’s to London next week! But about half of it I will leave there, so that’s alright, right?) 😉 We thought about buying a tagine while we were there. Thought we could buy one here but things got busy when we got back. Now I want to go buy one. I have an amazing recipe if you want me to send it to you.